One thing I’ve rarely written about on this blog is Star Trek The Next Generation. In fact, as I search through my entries to see if I’ve ever mentioned my favorite television show, I find that I’ve only mentioned it twice, and the second time, here, I promised to quote Jean-Luc Picard. Better late than never. For some, it’s the episode they most love to hate. Admittedly, the premise is ridiculous. An alien race called The Children of Tama that communicates only through metaphor, referencing history that of course only they could know. And yet The Children of Tama possess a complex technology at least as advanced as the Federation. We can’t understand what they’re trying to say, and vice-versa, despite the best efforts of the rather magical Universal Translator that rather amazingly makes everyone in the universe sound like Lawrence Olivier. If you examine the science too closely (in this case, the science is linguistics, fortunately something I know little about), it falls apart. That’s true of Star Trek throughout, of course. Everything from the communicators on their chests (how is it that only the person Picard is trying to call actually hears it when he says “Picard to Dr. Crusher” for instance?) to the warp drive to the transporter beam to the frequent breeding of unrelated species is pretty awful science when you get down to it. My favorite is when they did a baryon sweep to get rid of heavy particles. Of course baryons are just protons and neutrons, so a baryon sweep would simply remove everything. But I digress. I feel fortunate that I’m not smart enough to be bothered by the flaws in “Darmok.” Instead, for me the episode is itself a deeply moving metaphor. In many accounts, these races would be blasting away at one another, convinced the other is inferior because they speak gibberish. But ST TNG is different. It’s about understanding, “seeking out new life and new civilizations.” And this episode does it better than any I can think of. This must be the metaphorical way of saying “tell me a story.” Then Dathon pauses for a beat, realizing that of course Picard still doesn’t understand. And Dathon switches to a metaphor that Picard does understand. It was established earlier that “Timba, his arms wide” means “give as a gift” or something like that. It was the first phrase that Picard was able to understand, and it comes back here. Dathon uses his own language in an unconventional way, saying in effect “give to me the present of a story” instead of the more direct “tell me a story.” He’s creating a new usage that he has realized will help Picard understand. (Brilliant! This is, of course, what teaching is all about. No wonder I love this episode!) And Picard does understand, and shares a story that, in fact, is metaphorical of the situation Picard and Dathon face. In the end, Dathon dies, and Picard barely escapes with his own life. Picard then averts a war with the Chidren of Tama by using enough of the language to express his limited understanding of what has occurred. PICARD: Hail the Tamarian ship. PICARD: Temarc! The river Temarc in winter. TAMARIAN [on viewscreen]: Sokath, his eyes open! PICARD: The beast at Tanagra. Uzani, his army. Shaka when the walls fell. 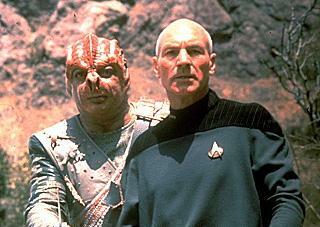 TAMARIAN [on viewscreen]: Picard and Dathon at El-Adrel. Mirab, with sails unfurled. PICARD: (holds out the dagger) Temba, his arms open. TAMARIAN [on viewscreen]: Temba at rest. While I have many, many favorite episodes of ST TNG, this one comes as close as any I can remember to being a perfect representation (maybe even a perfect metaphor) of why I watched the show in the first place. Sometimes loggerhead babies don’t make it out of the nest. Here‘s a hatchling that was released by a researcher after being discovered still in the sand. Yesterday, I wrote about why I teach, and how my reasons are not the reasons most teachers discuss. Their reasons are beautiful and moving, but they are not my own. The world is changing. The world is getting better – less violent, less polluted, smarter, healthier, more long-lived, and more conscious of the individual – and those changes owe a great deal to science and science education. Whether I want to or not, I believe that I do make the world better when I teach the values and principles of science. I am the sum of my experiences. I have been influenced all my life by great teachers. I am carrying on their work through my own. Their ideas live on through me. That is maybe not a calling, but it is a connection that stretches beyond my own boundaries. Perhaps, if I am passionate and energetic and very lucky, I will inspire other teachers myself. And so it goes on. The truth is that science is our only hope for survival. Life on Earth will someday come to an end, unless people with good explanations decide otherwise. By doing what I love, I perhaps can help the world survive. Interesting. I’m happy that it works out that way – but it doesn’t change why I teach. When you’re in love, you want to tell the world. Lots of people have lots of reasons for teaching. Some are so beautifully stated that they bring tears to my eyes. But as I read them I realize that none of them are me. Their reasons are not my reasons. And yet. Andyetandyetandyet. I love the starfish story. The star thrower isn’t trying to change the world. Yet we the readers recognize that she is changing the world, one starfish at a time. This to me is the essence of teaching. The world might be burning down, the barbarians might be pounding at the gate, but I, as a teacher, will stop, catch a breath, help that one student understand that algebra problem, show that one kid some amazing effect, give that one person one more experience they didn’t expect to have. Maybe it matters later, maybe it doesn’t. I don’t care. In that one moment, that moment of connection, that moment of shared effort for a common goal, there is beauty, and elegance, and poetry. I don’t believe I have a calling. I believe we make our own destiny. I don’t believe I have a God-given gift, because I don’t believe in God. That’s more than an existential question for me, it’s a philosophy. I believe we create our own meaning. If I’m a good teacher, and I believe that I am, it’s because I’ve chosen to become so. I own my choice. In a powerful sense, my choice is me. I don’t think people need to understand science. Again, Joseph Campbell – “Go on, live your life, it’s a good life, you don’t need this. I don’t believe in being interested in a subject because it’s said to be important or interesting. But, I believe, with the proper introduction, this subject may just catch you.” I believe science is a joy and a pleasure. Certainly it’s useful, but that’s incidental. And, incidentally, the usefulness comes down to joy and pleasure itself, if you follow it far enough. For what is life for, if not for joy and pleasure? The process of learning, of building explanations, of building castles in my mind, and the process of building a world from bricks and metal are one and the same. If you disagree, well then, go on and live your life. Find your own passions. I’m not trying to change the world. Even if, along the way, I do. Whitman said, “What good amid these, O me, O life? Answer. That you are here, that life exists, and identity; that the powerful play goes on and you will contribute a verse.” My verse is my work, my teaching, the starfish I’ve tossed and will continue to toss. Where do they go after I’ve tossed them? That I do not know, but in that moment of that connection, that act based on blind belief that one moment really does matter, therein you will find my story. Carl Sagan said it best. “When you’re in love, you want to tell the world.” I’m in love. And so I teach.